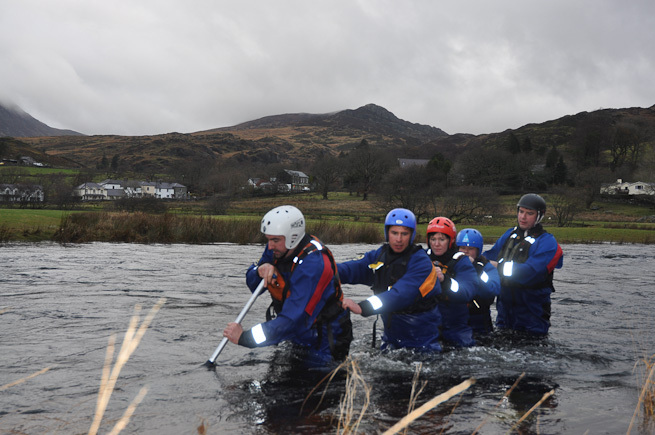 Despite grim weather and raging rivers, the Frontier Team completed four days of valuable training in North Wales. Photo: Paul Kirtley. 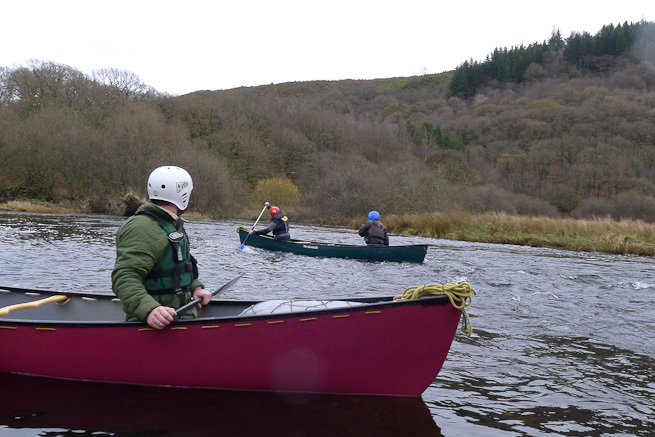 A contingent from the Frontier Bushcraft instructional team braved grim November weather in North Wales to undergo four days of canoe skills plus white water safety and rescue training, all with canoe maestro Ray Goodwin. 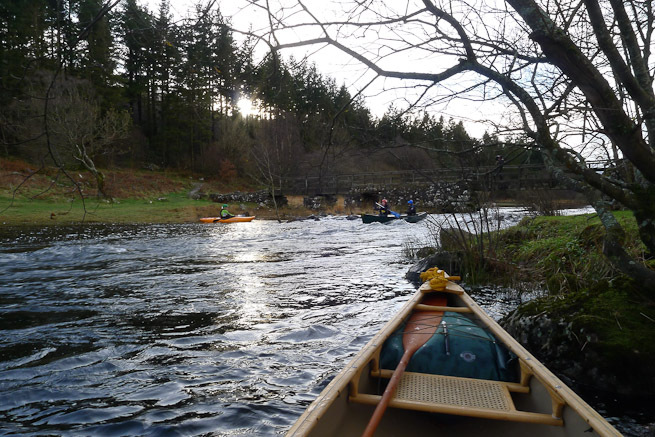 A few of the team attending had not paddled before and it's testament to Ray's coaching skills that they were competently paddling rapids towards the end of day 2. 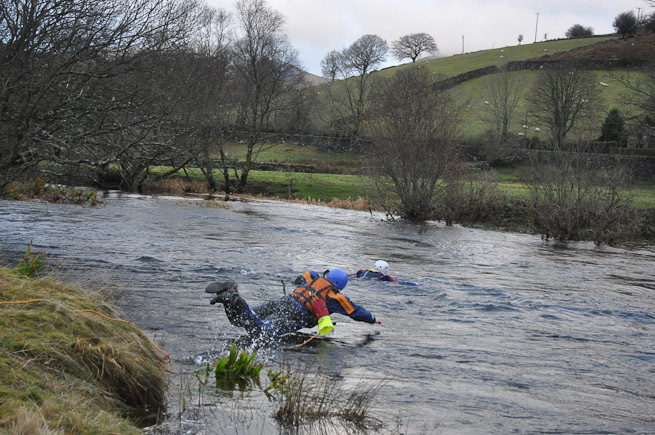 Every year members of the Frontier Bushcraft team undertake a white water safety and rescue course. 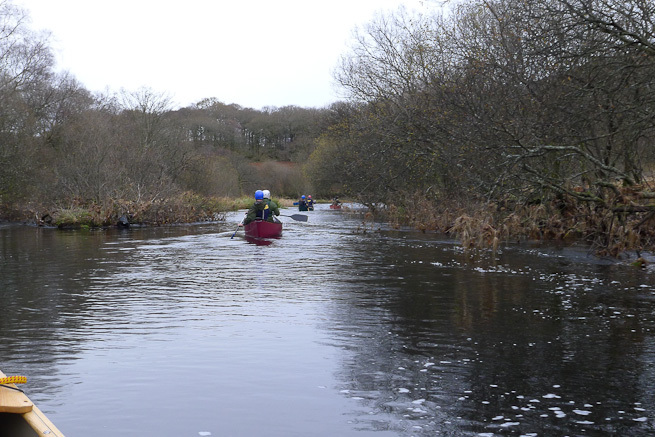 It's important for not only the team-members who are involved in our canoeing expeditions but for any outdoor activities that take us and our clients near to water. 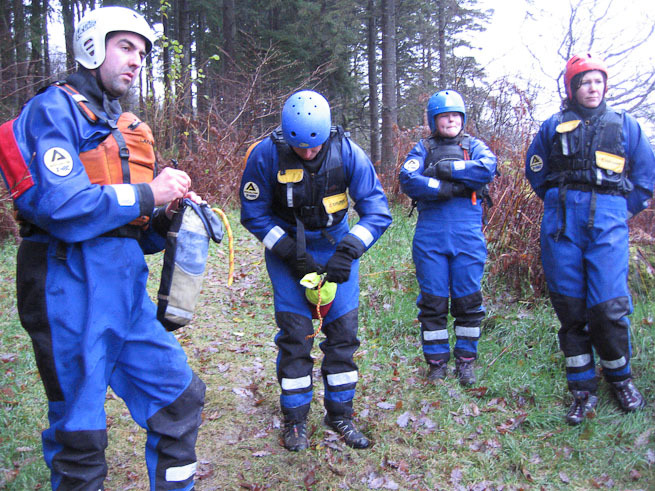 The training allows all members of the team to understand the dangers posed by water in the great outdoors in addition to providing techniques and strategies for minimising risk as well as dealing with mishaps. 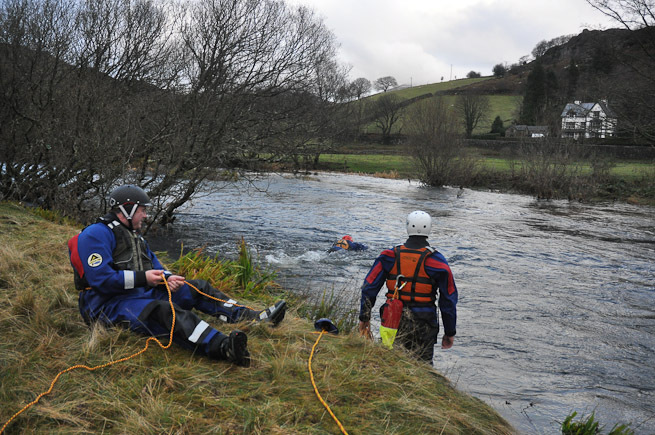 All the rescue training was undertaken in a 'live' outdoor environment rather than at a training centre. 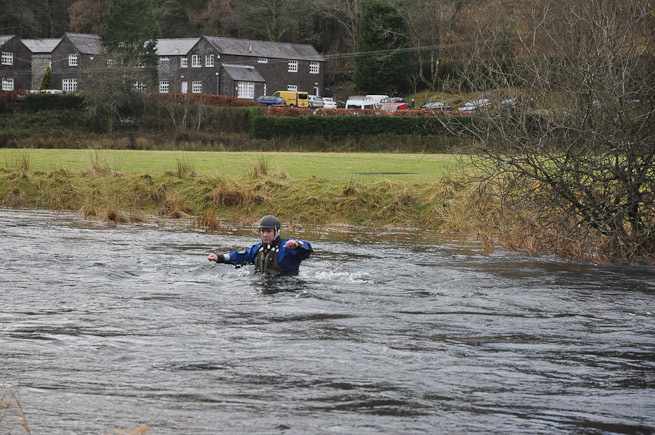 Over the four days, temperatures were consistently around 4 degrees Celsius, with heavy rain and winds. Water levels were high and came up higher. Despite the cold conditions, it was great to be training as a team and it was a lot of fun. Below is a photoblog of the weekend, with some some beautiful views of Snowdonia as a backdrop when the clouds rose high enough. 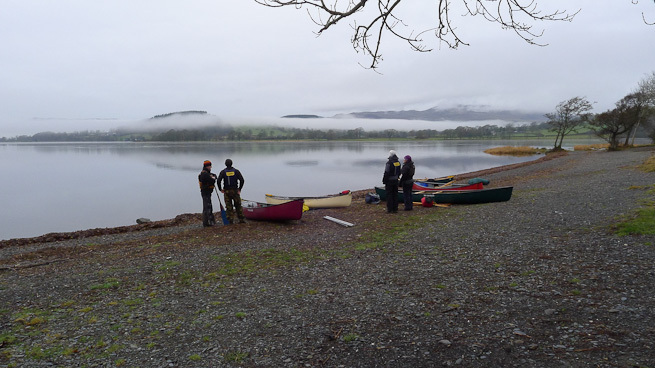 A misty start on Llyn Tegid. Photo: Paul Kirtley. 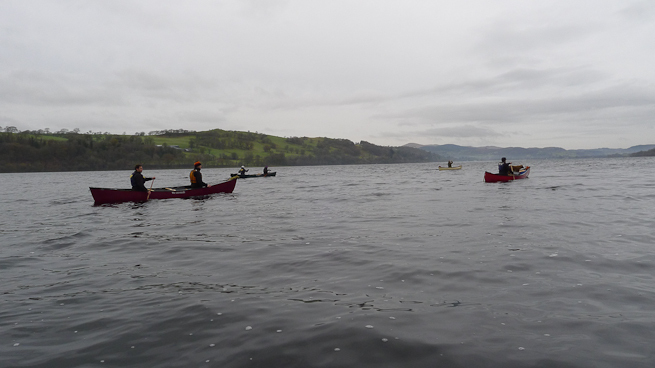 Following some coaching in basic forward paddling strokes and rudders for the beginners amongst the team, we got under way on Bala/Llyn Tegid. Photo: Paul Kirtley. 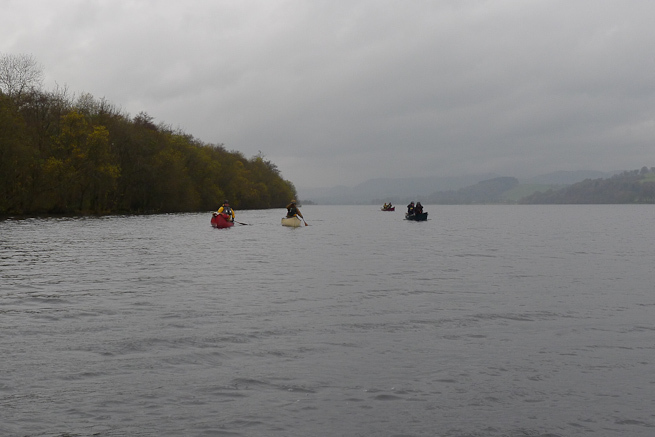 Frontier Bushcraft team members paddling down Llyn Tegid. Photo: Paul Kirtley. 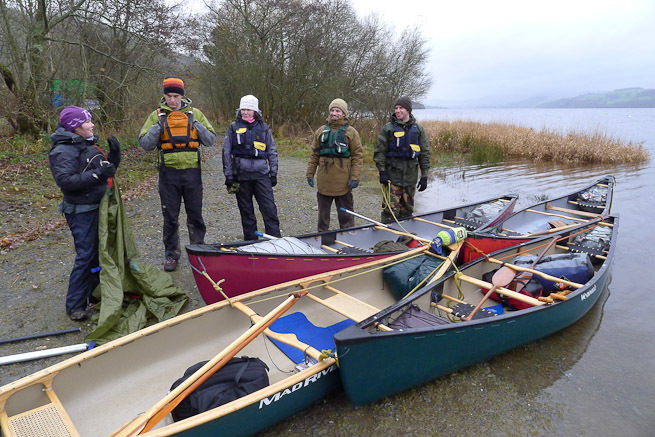 At the end of the lake, we tied the canoes together into one large raft. Photo: Paul Kirtley. 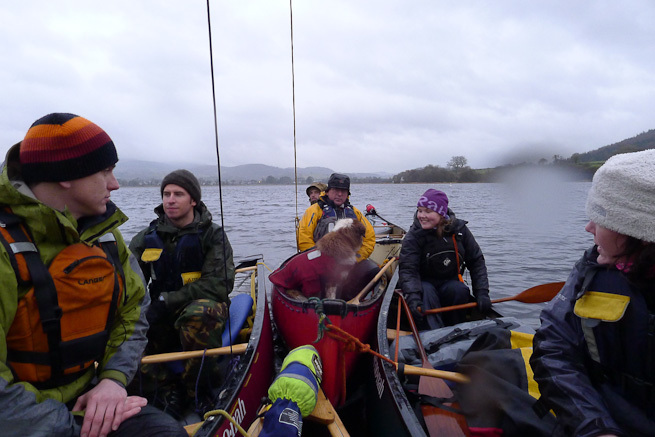 The idea was to then sail the rafted canoes back up the lake. Here Henry and Matt lash together two poles to create the frame of a sailing rig. Photo: Paul Kirtley. Some impromptu knot lessons from Ray Goodwin. Photo: Paul Kirtley. Erecting the sailing rig. Photo: Paul Kirtley. 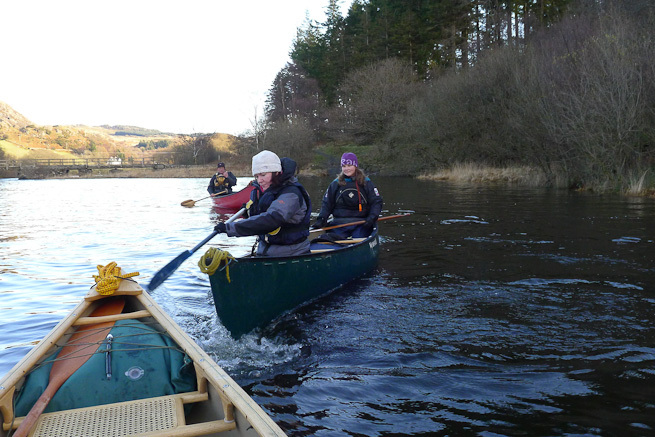 The Frontier Bushcraft crew sailing their rafted canoes back along the lake. Photo: Paul Kirtley. 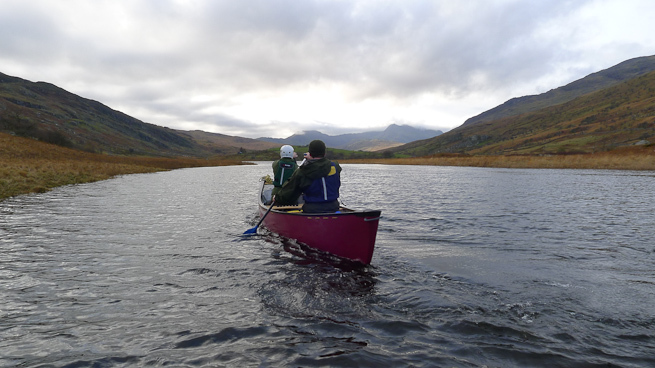 We started the day on the flat waters of Llynnau Mymbyr near Capel Curig, with the beginners getting to grips with some control strokes they'd need for moving water. Photo: Paul Kirtley. 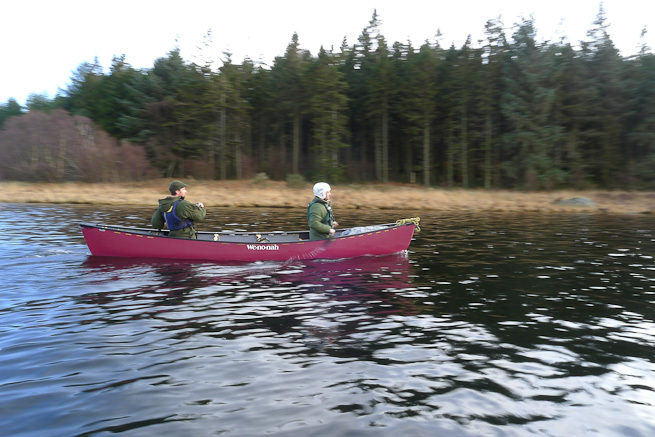 Henry and Ben paired up to paddle the Wenonah 'Rogue'. Photo: Paul Kirtley. 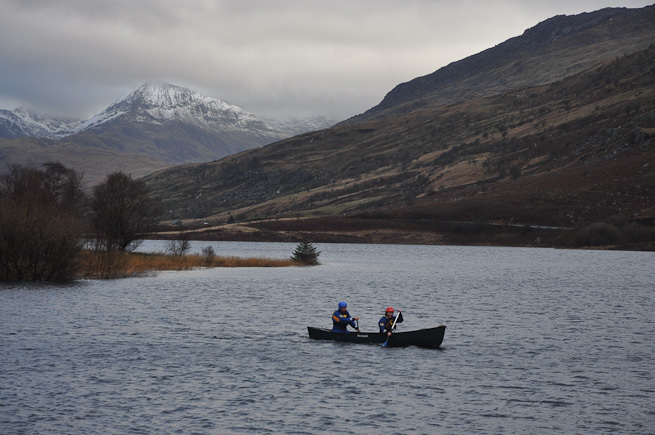 With Snowdon in the background, the setting of these little lakes is dramatic. Photo: Paul Kirtley. 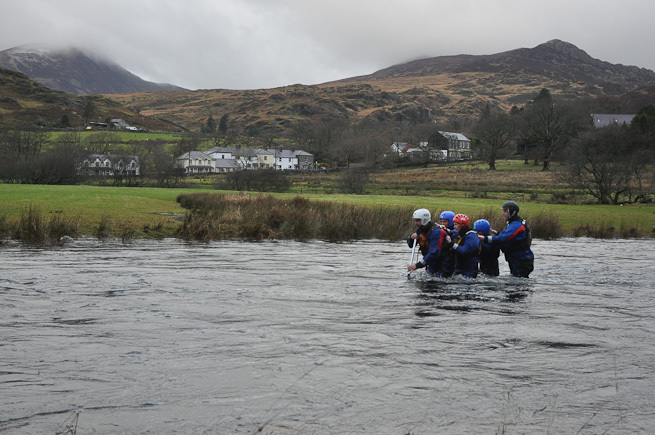 We headed down the outflow of the lake and Sheri and Alison tackled their first moving water. Photo: Paul Kirtley. 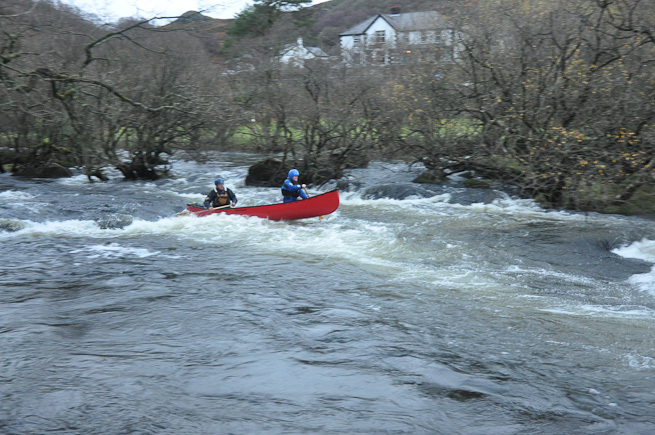 We then headed down the river Llugwy. Photo: Paul Kirtley. We stopped in multiple spots to practice eddy turns, S-turns and ferry glides. Photo: Paul Kirtley. 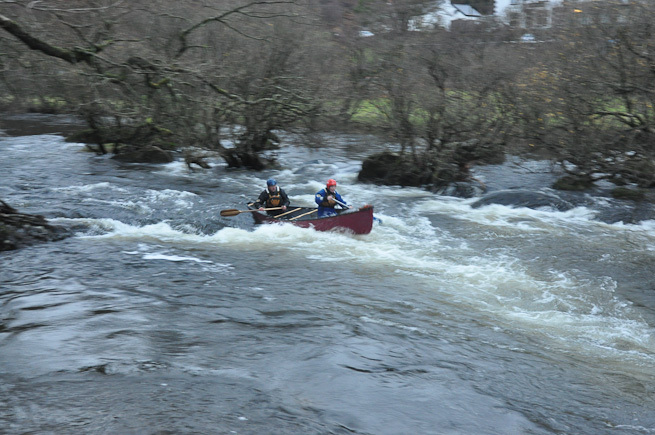 We finished the day by running the rapids at Jim's Bridge. Photo: Ben Gray. 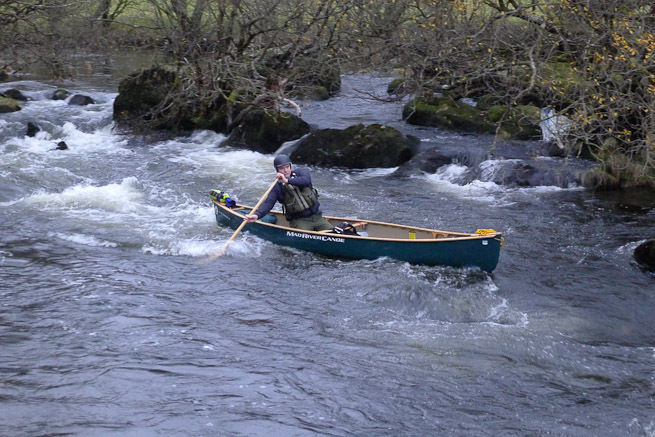 Since our usual WWS&R training venue, the River Dee, was in serious spate due to all the rain, we headed back to the Llugwy. 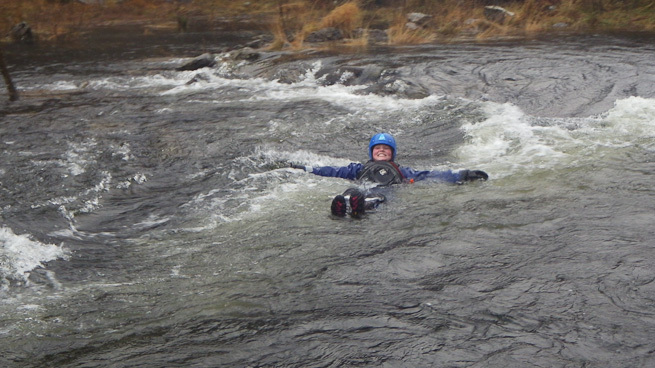 This time, though, we were equipped with dry suits. Soon we were very glad of this! Photo: Paul Kirtley. Keeping your feet up is very important! Photo: Ray Goodwin. 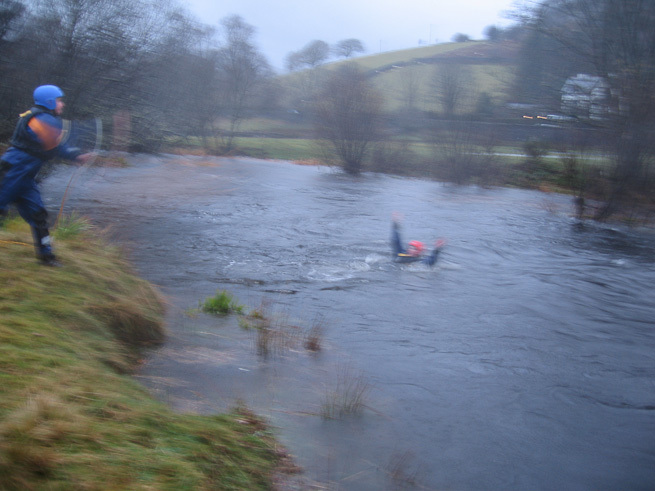 Swimming clear into an eddy. Photo: Paul Kirtley. 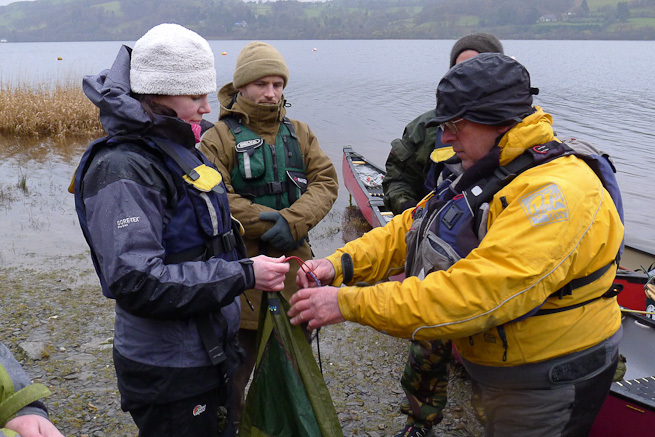 We practiced some capsize drills in the lake then, after practicing throws on dry land, we moved further downstream to a spot where we could undertake throw-bag rescues. Photo: Paul Kirtley. Ray Goodwin demonstrating hand position on rope. Photo: Paul Kirtley. Day 4 saw us return to the same area. It had been raining overnight again and the water had risen. On the high ground there was snow. Photo: Ray Goodwin. 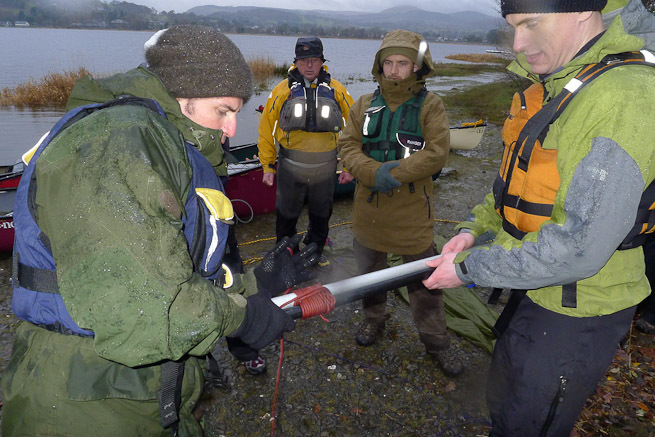 We had started with some livebait rescues (more below) then moved onto recovering boats in moving water. Photo: Ray Goodwin. 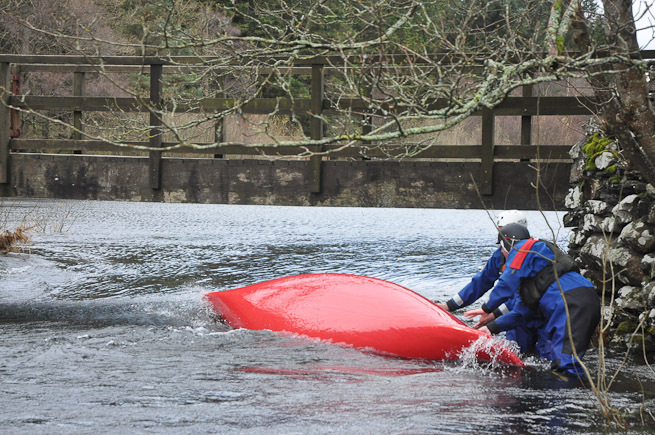 Turning a boat over for another pair to recover. Photo: Ray Goodwin. 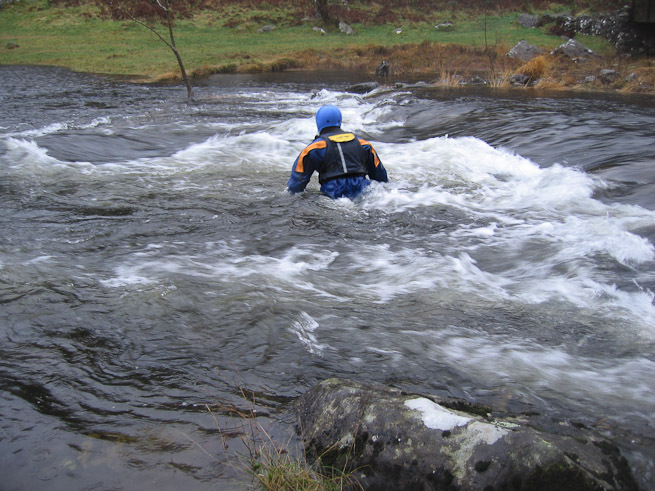 We then headed downstream to explore various techniques for wading moving water. Photo: Ray Goodwin. Wading as a wedge. Photo: Ray Goodwin. Wading as a line. Photo: Ray Goodwin. 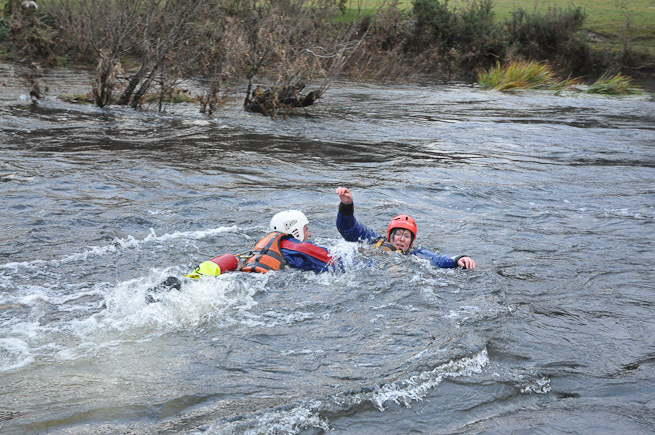 We then paddled further downstream to practice more rescues. Here we're poised for a livebait rescue. Photo: Ray Goodwin. James goes for Alison. Photo: Ray Goodwin. Henry leaps to the rescue. Photo: Ray Goodwin. 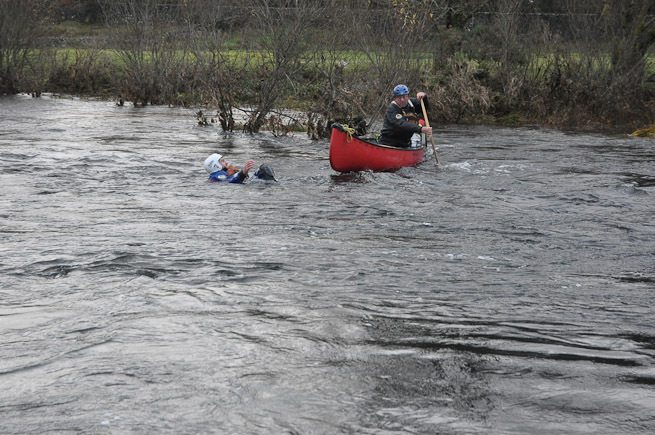 We also looked at other methods of getting to a swimmer. 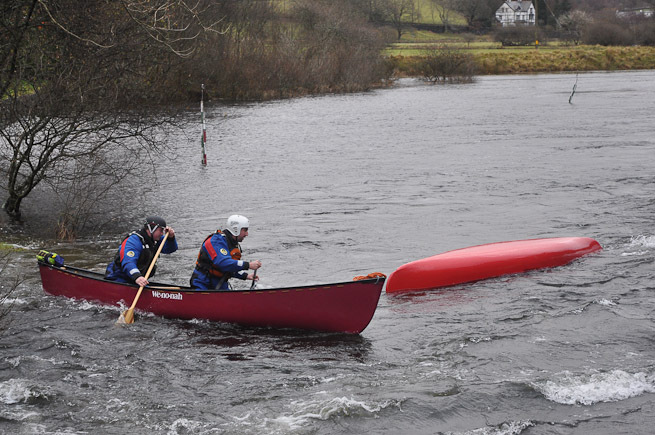 Here Ray intercepts James by canoe. Photo: Paul Kirtley. 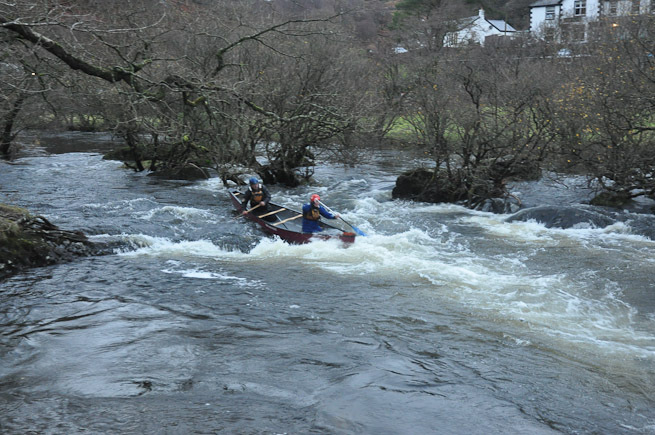 Ray and Alison run the Wenonah 'Rogue' through the waves at Jim's Bridge, Afon Llugwy. Photo: Paul Kirtley. 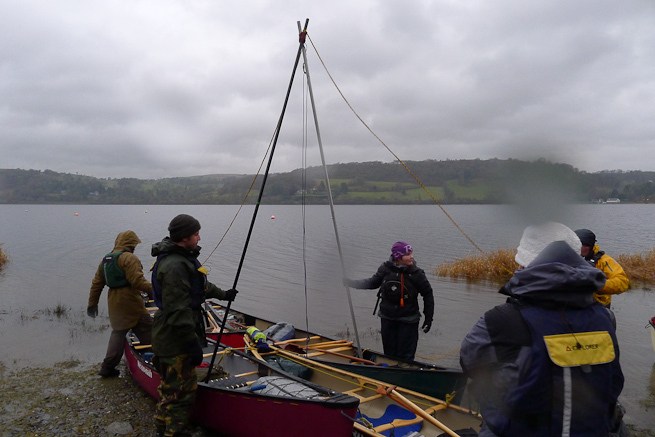 We finished off the course by looking at methods of unpinning boats, using different means of gaining a mechanical advantage with ropes and pulleys. It had been an excellent four days. 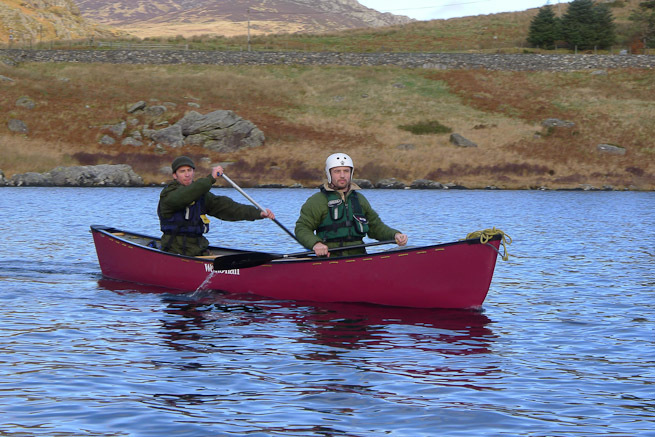 The two pillars of the course had dovetailed seamlessly, with the canoe training of days 1 and 2 flowing nicely into the water safety training of days 3 and 4. 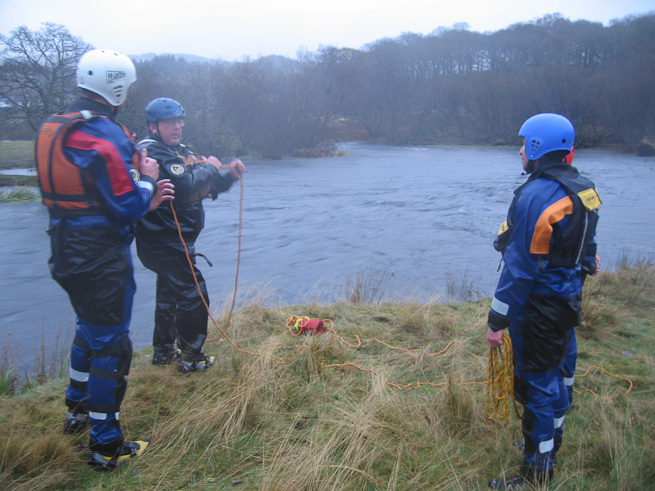 The weather had been grim most of the time and we had, at times, been cold and wet; but this type of training is always invaluable in keeping our skills sharp. Below is a fun video of some highlights from days 3 and 4. Given the epic weather conditions, we've put our tongues firmly in cheek and chosen some suitably epic music to accompany this short video. Looks like you guys had a great time, fun and invaluable skills learned at the same time! Really envious of the stuff you guys get up to. Looked like a good four days training with good quality conditions to work in, nice write up as well. Wishing you & your team a good Christmas & New Year. Good to hear from you. 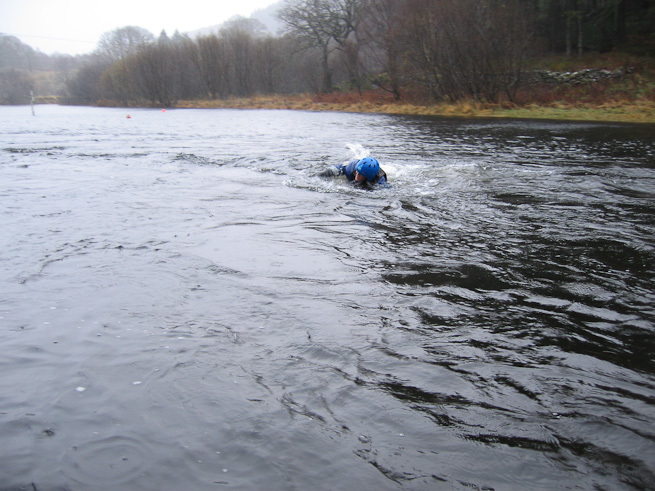 Yes, the training was good (as it always is with Ray) but the conditions were very different to last year and the variation in training venue was also valuable. Wishing you a very Merry Christmas and I look forward to seeing you in the New Year.